On April 4, 2015 Syrian rebels shelled a government-held neighborhood in Aleppo. Nine people were killed and dozens were wounded.If anything, this demonstrates the sheer brutality of the civil war. More frightening, though, was Assad’s response. 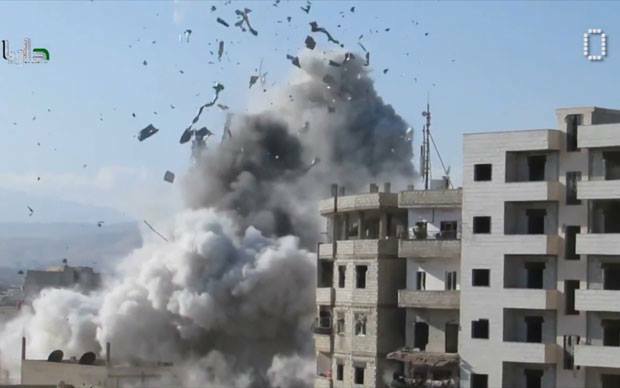 Since the initial shelling, the regime has dropped 36 barrel bombs on the Yarmouk refugee camp. A barrel bomb is an improvised explosive device (IED) made from large barrel-shaped containers that carry explosives, shrapnel, oil, and/or chemicals. Assad recently claimed, in an interview with Charlie Rose, “there’s no such a thing called barrel bombs.” Syrian civilians would disagree. What is most terrifying about these weapons, however, is how they kill. Not only do they cause destruction, but the weapons also create a buzzing sound that civilians hear ten minutes before the bombs detonate. Thus, these weapons evoke fear before, during, and after they are used. Therefore, barrel bombs are very different than normal explosive devices. There is much evidence demonstrating the sheer destructiveness of barrel bombs. For example, Assad’s usage of the weapon resulted in 41% of all civilian deaths in Syria during August 2014. Their crude force is demonstrated by an article in Foreign Policy that estimates food shipments to rebel-controlled areas decreased by 26% over the course of 2014 due to this specific type of IED. This, unsurprisingly, has resulted in many citizens fleeing. For example, barrel bombs were indiscriminately used on the rebel-controlled Aleppo during 2013-2014. Ben Hubbard analyzed in February 2014 that Assad focused on Aleppo in order to force pro-rebel civilians to flee the city making it easier for the regime to conquer. To his point, these attacks resulted in an estimated 250,000 citizens fleeing the aforementioned city. Moreover, an analysis conducted by Human Rights Watch suggests barrel bomb attacks have been focused on necessary areas such as hospitals, rather than to fight ISIS. Thus, the inhumane weapon has been a significant tool in the regime’s arsenal. It is probably clear that barrel bombs are not a new phenomenon. Since the passage of UN Security Council Resolution 2139 – which was passed in February 2014 and called for an end to barrel bombs – 6,163 civilians (including 1,892 children and 1,720 women) have been killed by the disturbing IED. Thus, these weapons have wreaked havoc by removing thousands of Syrians. What is occurring in Yarmouk is a reflection of the tragedy of the Syrian war. Both sides of the conflict have killed in cold blood. Moreover, thousands are dead and millions displaced. Therefore, it is not fair to claim that barrel bombs are the worst aspect of the conflict. Yet, by understanding the sheer destructiveness of this military tool, it becomes easier to understand why Syrians continue to flee the country. Thus it is unfortunately clear, as long as the war endures, the Assad regime will continue to deploy barrel bombs due to their cruel effectiveness. Violence surrounding this camp erupted on April 1 when ISIS was reported to have taken control. For more information see, “Aleppo Shelled as Syrian Humanitarian Crisis Worsens,” Al Jazeera, April 12, 2015. http://www.aljazeera.com/news/middleeast/2015/04/unrwa-chief-heads-syria-urgent-yarmouk-mission-150411144408169.html. “Syrian President Bashar Al-Assad On 60 Minutes,” CBS News, 2015, http://www.cbsnews.com/news/syria-president-bashar-al-assad-60-minutes-charlie-rose/. Human Rights Watch. Syria: Barrage of Barrel Bombs. July 30, 2014. http://www.hrw.org/news/2014/07/30/syria-barrage-barrel-bombs. Hubbard, Ben. “Bombing in Syria Force Wave of Civilians to Flee.” New York Times, February 17, 2014. http://www.nytimes.com/2014/02/18/world/middleeast/bombings-in-syria-force-wave-of-civilians-to-flee.html. Human Rights Watch. “Syria: New Spate of Barrel Bomb Attacks.” February 24, 2015. http://www.hrw.org/news/2015/02/24/syria-new-spate-barrel-bomb-attacks. Jordan Cohen is a Master’s candidate at George Mason University studying Middle East and Islamic Studies. He received his B.A. in History from High Point University. Tags: Aleppo, Assad, Barrel Bombs, Foreign Policy, Human Rights Watch, Syria, United Nations. Bookmark the permalink. so what is the difference between a barrel bomb and a cluster bomb? ?